The Festival of Education (FOE) to be hosted by Rajasthan State Government will begin on August 5 in Jaipur. The festival will be a two-day event which seeks to increase education opportunities in the state and enhance the experience of students. 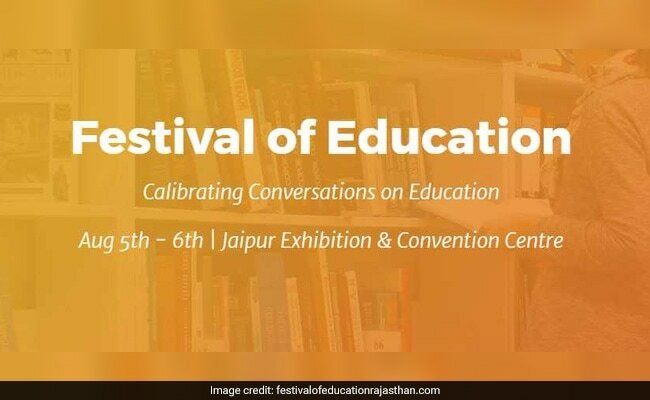 Festival of Education will begin on August 5 at Jaipur Exhibition and Convention Centre. New Delhi: The Festival of Education (FOE) to be hosted by Rajasthan State Government will begin on August 5 in Jaipur. The festival will be a two-day event which seeks to increase education opportunities in the state and enhance the experience of students. The event has many esteemed names from various fields lined up as speakers for the event. The event has already created enough buzz on social media with a tweetathon and blogathon dedicated solely to the event. The event will be kicked off on August 5 at Jaipur Exhibition and Convention Centre. A CSR portal will also be launched at the event. Some of the dignitaries who would be addressing the attendees at the event include the Rajasthan Chief Minister Vasundhara Raje, His Highness Sheikh Nahayan Mabarak Al Nahayan, Minister of Culture and Knowledge Development, UAE, Prakash Javadekar, Union Minister of Human Resource Development, and The Rt Hon. Baroness Usha Prashar, Member, House of Lords, UK and Deputy Chair, British Council. The event will also be marked by sessions with Shankar Mahadevan, Singer and Composer, Avni Rai, Film Maker, Shabana Azmi, Actor, Akshay Kumar, Actor, Sushmit Sen, Actor, Divya Dutta, Theatre and Film Actor, JJ Valaya, Designer, and Manish Mehrotra, Chef and many other veterans from different fields. While the entry to some of the sessions and events is free, the entry to some of the events will be registration-based. The registration for the sessions are open and individuals looking to attend the events can register through the Festival of Education official website. There would also be various cultural competitions - Antaragni and Harmonexus for school and college students. Anataragni is a group dance competition for school students while Harmonexus is a band competition for college students. Interested students can register throught he official website. The event will see participation of educators, students, parents, policy-makers, influencers alike and will shape the roadmap for education.